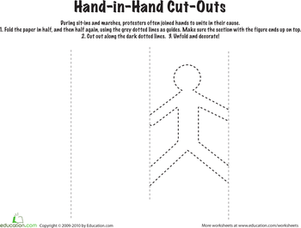 Create a family treasure ... and reinforce social studies basics while you're at it! This activity mixes three great ingredients: paint, big paper and family. Plus, you can help your second grader reinforce an important social studies skill: judging things in context of their place and time. It might be a little messy, but we think it's worth it. A large sheet of heavyweight white paper, approximately 12” x 30” (but it’s OK if it’s a little bigger or a little smaller). As many family members as possible—this can include just your nuclear family, including pets, but don't leave out aunts, uncles, cousins and grandparents if they are around! Ask your child to paint his or her right hand with a favorite colour. Make sure the paint covers the full hand, and then press it down onto whatever area of the paper your child chooses—if you’re not sure you’re doing this right, practise on a smaller piece of paper. Repeat this step with as many family members as you can gather, each of them picking from one of your colour choices. This includes you, of course, but also pets and babies too! If you have a small group, you may have room for two hands per person; with a large group, you'll only have space for one. You may want to put hands in order, but a “collage approach” works just fine too. In any case, try not to have the hands touch—you will want to leave space for the next steps. Let the runner dry. Most children’s paints dry fast, but don't skimp on this step. There's nothing more discouraging than a smudged masterwork! Sign and date it. Then ask each family member to add his or her signature and full name (first, middle and last) plus birth date (month, day and year) next to his or her hand. Worried about pet literacy? Appoint your child "Animal Secretary" and put ThemOn the job. Date the “document.” With luck, this runner will be a family centerpiece for years. 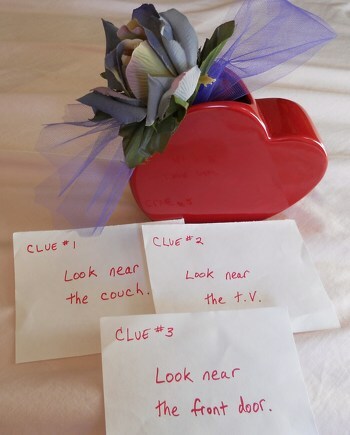 Choose one side, and have your child write your family's name, along with today's date, in his or her best writing. 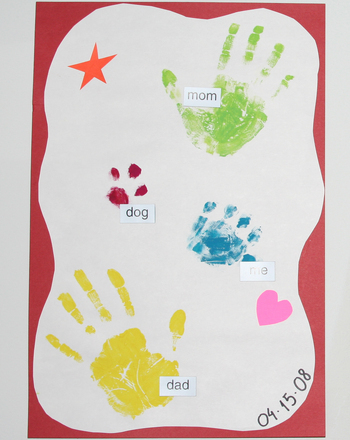 With your child's help, use a non-acid glue stick to glue the white paper to the colored border sheet. Then take your masterpiece to a local duplication store with a laminator—you can often find this service through Kinko's, Office Depot or Office Max, for example. Congratulations! For a few dollars, you've created a colorful, attractive family treasure to enjoy for years to come. For your young learner you've also communicated an early social studies lesson, which will be a crucial foundation for the future: your child was born into the context of a broader society, which has developed over time. Grandpa and Grandma were born decades ago; Mom and Dad decades after that; your child followed; and so on. In subsequent grades teachers build on these lessons in more and more elaborate ways. In the meantime, the meals you savor together will testify: there's nothing quite like the power and comfort of family love. 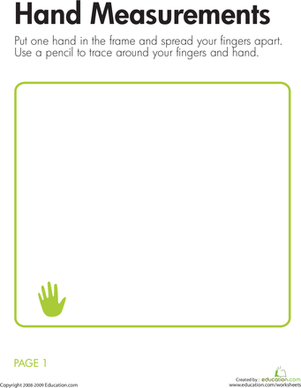 On this hands-on year three maths worksheet, kids measure the length and width of their hand and the length of their fingers to the nearest inch or half inch.